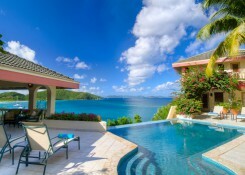 An exceptionally private, 5-star luxury villa, with breathtaking views of the turquoise waters of the Caribbean. Check our Specials Page! A Dream Come True Estate is better than ever after stunningly beautiful renovations “post Irma.” We opened for business July 1, 2018. It’s time for you to come back to this peaceful paradise! Did you know? Travel & Leisure Magazine’s readers recently rated Virgin Gorda as the #2 island in all the Caribbean, including the Bahamas and Bermuda. 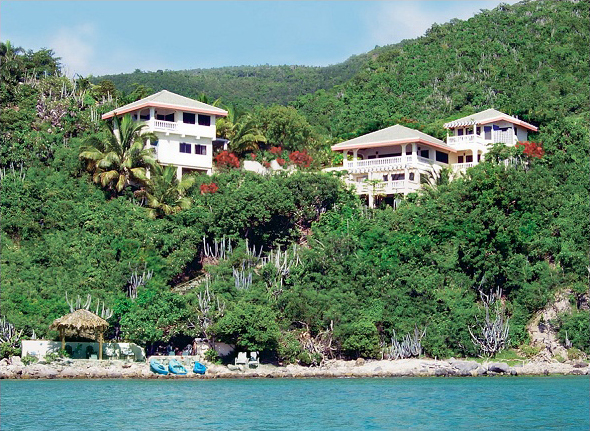 A Dream Come True Villa has 92 “5-Star” reviews on TripAdvisor, far more than any other LUXURY villa on Virgin Gorda. It truly is in a class by itself. We welcome our new villa chef, Chef Shelford Tucker, who will now be providing our complimentary Welcome Dinners for our guests. Chef Tucker is simply exceptional. His catering company, OUTTA HERE FOOD & CATERING SERVICES, offers A Dream Come True’s guests the option of choosing Chef Tucker’s daily breakfasts, brunches, and dinners during their vacations with a varied and interesting menu. Or guests may choose an occasional meal, knowing that their individual needs will be met with professionalism. He also offers provisioning before arrival. Named “TOP VACATION RENTAL on VIRGIN GORDA,” A Dream Come True Villa has all 5-star reviews from its guests. You can read our reviews on TripAdvisor and HomeAway. It is unique among Virgin Gorda villas: a nearly acre oceanfront estate, offering those who seek exceptional privacy a gathering place with generous guest amenities for friends and family. From every vantage point of this 6,500 square foot, 5-bedroom, 6-bath luxury villa for rent, the hillside location provides guests with 180° views of turquoise waters. While relaxing at the seaside verandah and thatched-roof pergola, guests may swim, snorkel or kayak to Pond Bay Beach or Savannah Bay Beach. 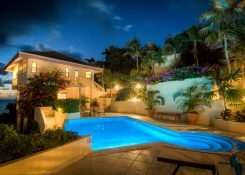 The vacation villa’s setting offers gentle breezes, overlooks pristine, peaceful Virgin Gorda beaches, and has panoramic views across the Sir Francis Drake Channel to Tortola. A Dream Come True Villa, known as a premier luxury villa vacation rental, is exquisitely decorated with custom furnishings and every comfort in mind. The sparkling granite kitchen, updated Tommy Bahama interior furnishings, and colorful tropical flowers surrounding the villa will delight your senses. “When we opened the gate and stepped in, we all gasped at how beautiful the villa, pool and views were…” ~ Lisa F.
Surrounded by lush gardens, the one-acre estate comfortably sleeps 2-14 guests in luxury accommodations updated in November 2013. You always have exclusive use of the villa no matter the size of your group. The property’s centerpiece is a new, spectacular Infinity pool overlooking Savannah Bay, with the main Caribe House and Bali Wing on either side of the pool and its spacious decks. Contact us today to book your reservation or find us on Facebook for more information about your Virgin Gorda getaway! Book directly and save the 5-10% booking fee now charged by HomeAway, VRBO, and FlipKey. Why would you pay a fee to book your own vacation? Spend it on a boat rental or spa services at the villa instead…. 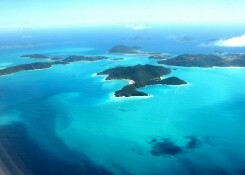 Our award-winning island estate is unique because of its oceanfront location, exceptional privacy and exquisite beauty. Daily maid service, indoor/outdoor living and breathtaking vistas provide our guests an instant dose of rest and relaxation. Book your dream vacation with us. We’d love to have you! ADCT was featured in the MANSIONS section of The Wall Street Journal, September 5, 2014.